This week will lock in my capsule pieces for the #RemixFix2015 challenge. 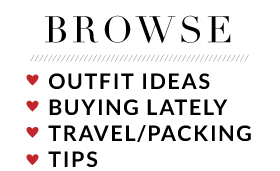 I've got a few different polyvore sets started where I've been cataloging each piece I've worn over the last 2.5 weeks. I will have to share the completed capsule with you next week and then it will be full on remixing from there! Seeing all my items nicely categorized and next to each other has really helped me understand where there are gaps. One thing I was missing was a simple graphic tee. I have a few in my collection, but ultimately decided this one had to make the cut. I discovered it on Instagram here thanks to Andrea from Momma in Flip Flops. It was designed by one of her blogger friends, Ellen, from That Chic Mom. While this tee is not currently available, if there are enough reserved, another batch can be printed! You can reserve yours here. 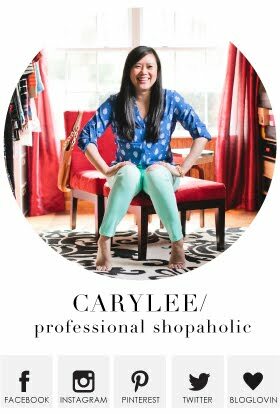 Love that fun, dressy shoe tee and for a shoe-lover like you, it is awesome! 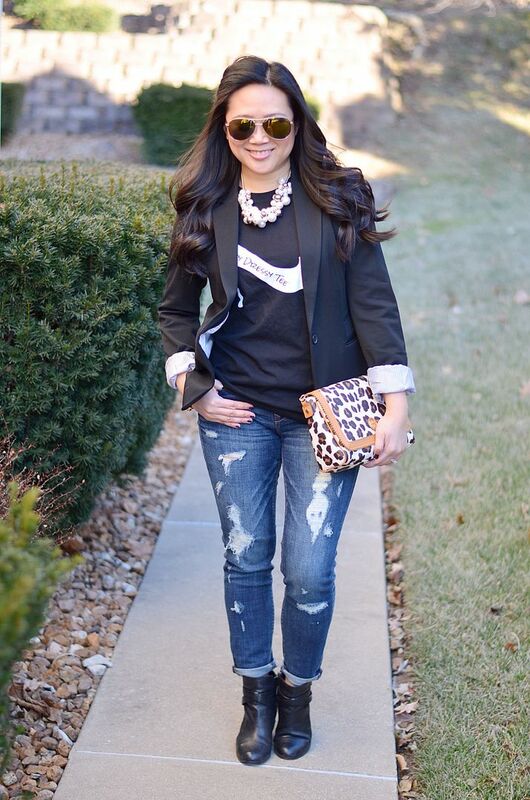 A graphic tee with jeans and a black blazer is always a winning combination, Carylee! 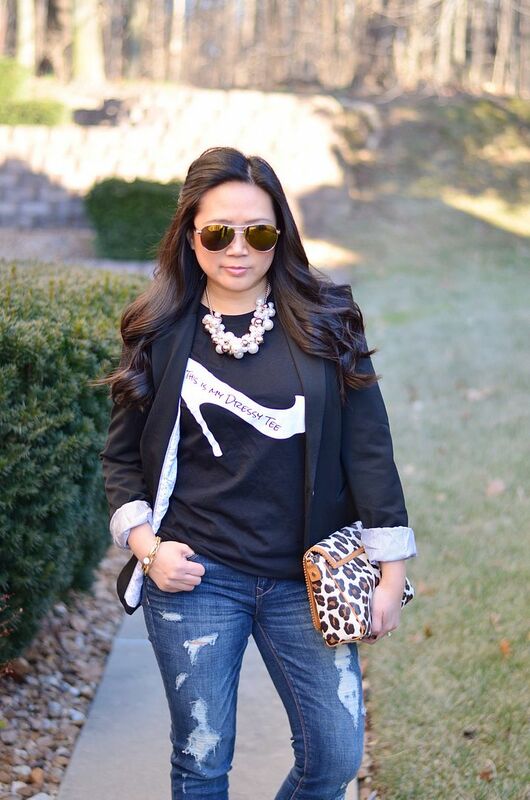 This is such a fun look, love that graphic tee with the blazer!! Graphic tee's are lacking in my wardrobe too. Lol your outfit is on fleek indeed, you look sharp and stylish. You hair is fabulous here, love this do. Super cute outfit. I really love that bag! I am obsessed with that Tee! Such a cute look! I recently ordered the cropped version of those jeans and I am soooo excited to get them, especially after seeing them again here. You know I love a good dressy/casual outfit with a blazer like this, so of course I love this whole look. Your last paragraph pretty much sums up my thoughts on this outfit completely!! Perfect, perfect, perfect!! I too need to throw on a blazer more often with a simple tee...I don't do that enough! YASSS to a good pair of destroyed jeans. I get weak at the knees for any great pair of denim and these are fab. But that tee is the CUTEST! I love, love this outfit. Makes we want to get some black blazer now. I LOVE this outfit! Those destructed jeans are KILLER! such a cute tee! love it with the blazer! 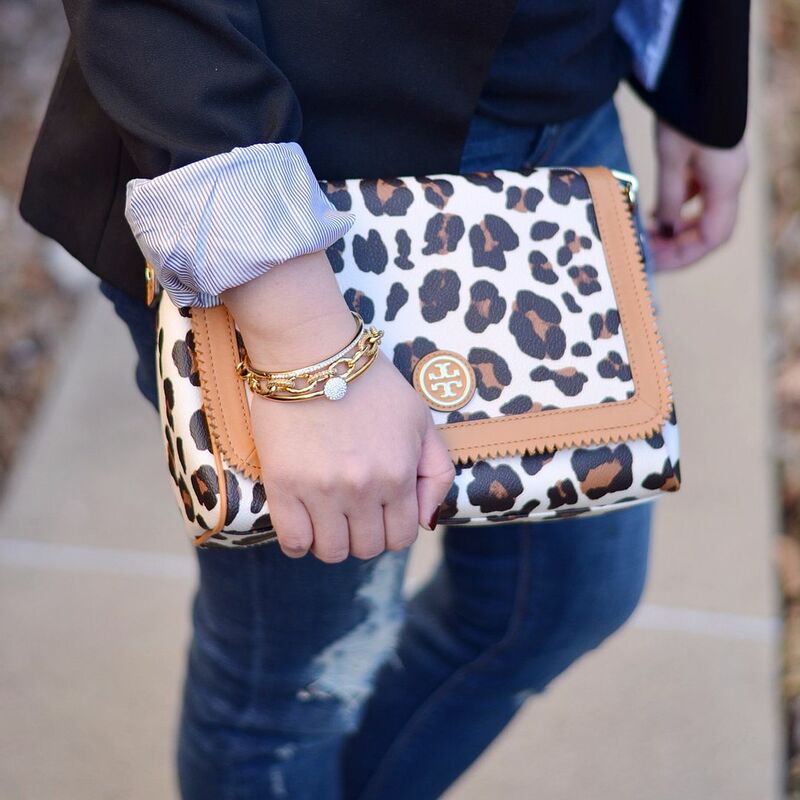 This outfit is a perfect mix of dressy and casual. 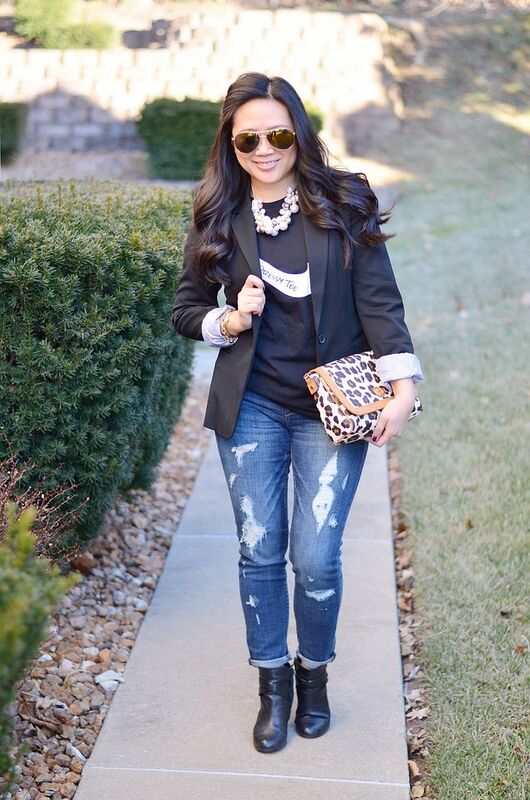 I love that you paired ripped jeans with a blazer and pearls! SO FUN! I love that tee, it is adorable! I love the distressed denim too! Thanks for linking this fabulous in black look at Hey Girl, it's Wednesday ! You are seriously too cute! That tee though...hmmm, NEED it for sure in my life. lol. Thank you for joining the Thrift Sisters link up.